Need help finding the best outdoor waterproof dog beds? We’ve got you covered with this detailed guide. We review the 8 best dog beds for outdoors to help you make an informed choice. A hard deck can be especially tough on a dog with achy joints. You’ll want something that doesn’t get ruined the first time it rains, though. Check out our picks for the best waterproof dog beds to use outside! Check out our table with quick facts, then read on for more details about each bed! The PetFusion Ultimate Dog Lounge is a perfect option for a dog wanting to hang out outside with their owner. 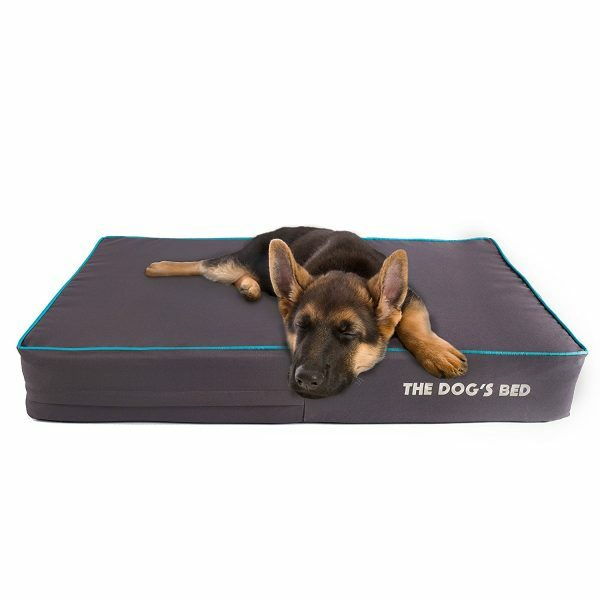 The 4-inch memory foam makes this outdoor waterproof bed perfect for dogs with joint problems, such as Rottweilers or German Shepherds, because it’s soft surface with a lot of give. It will support their joints rather than causing more issues like a harder surface such as your deck. A non-skid bottom to ensure your deck doesn’t suffer any damage. After all, there’s nothing worse than a beautiful deck that has a bunch of skid marks. The armrests on either side provide your dog with somewhere they can lay their head. As we all know, dogs need somewhere to put their heads for optimal comfort. Equipped with a water and tear resistant cover. Due to this, you won’t have to worry about this product getting ruined in the rain or your dog tearing it apart. It will hold up against any rowdiness from your dog. And you will no longer have to regularly bring in your dog’s bed when it’s raining. If you’re on a tight budget, the prices are a bit steep for owners with larger dogs. Doesn’t have a waterproof liner. This outdoor waterproof dog bed comes in four different sizes to ensure it fills the needs of any dog: small, large, X-large, and XXL-jumbo. If you have a small dog…or a larger budget…the PetFusion Ultimate Dog Lounge is a great choice. It’s a stylish bed with some great features. The arm rests are a definite plus! The First-Quality Orthopedic Dog Bed is a 5-inch thick outdoor waterproof dog bed that caters to senior dogs. However, this doesn’t mean it won’t make a great bed for any dog. Honestly, it’s just the opposite. Any dog could benefit from having this bed in their lives. It’s comfortable, reduces stress on joints through gently cushioning your dog’s pressure points, and comes in a variety of colors to keep your dog in style. The memory foam inside the bed is shredded for softness then densely packed in the bed to ensure an immense amount of comfort for your dog. Comes with a 1-year money back guarantee. Compact enough to fit inside most dog crates. Its compactness makes it an essential purchase for any dog owner who often finds him or herself out of the house. The sense of comfort it will provide makes leaving your dog at home a little easier. Has waterproof lining to give the bed extra coverage against any water damage. If the features mentioned above weren’t enough, 10% of all Better World Pets’ profits go to the Humane Society. You can confidently say that by buying this bed, you’ve helped more than one pup get a little more comfortable. The bed weights quite a bit, so, it’s hard to move around. The bad reviews seem to focus on this aspect. Another reoccurring complaint is the bed’s easy to rip apart for strong-jawed dogs. Not an ideal purchase for an owner of a Staffordshire Bull Terrier. There are four different sizes for this bed: small, medium, large, and XL. At this moment, the medium is unavailable. Better World Pet’s First-Quality Orthopedic Dog Bed has some great features and reputation; however, its cons make it only a reasonable purchase for a small group of dog owners. But, it deserves a place on this list through its inventive features and the connection to a great organization. After all, it’s an excellent outdoor dog bed for an owner with a small or senior dog that won’t try to chew it apart. The Laifug Orthopedic Memory Foam Large Dog Bed is an outdoor waterproof dog bed that fills every requirement you could want out of your dog’s favorite sleeping spot. Filled with memory foam for your dog’s pleasure. Your dog will sink into its heavenly fluffiness. The waterproof liner ensures there will never be any problems with rain destroying your dog’s favorite sleeping spot. It allows you to feel entirely safe about leaving this bed outside. The bed also has a removable cover made from soft faux suede to reach peak levels of comfort. Another unique feature is its separated design. This design allows you to separate the center memory foam part from the rest of the bed. By doing this, you could have two dog beds. Don’t worry; the outside part contains high-quality foam that will still be extremely comfortable. In fact, the dog lying on the outer portion won’t even notice the memory foam part is missing. Lack of size variety could offer trouble for owners with bigger dogs such as Great Danes or Saint Bernards. Some issues concerning the memory foam being weak and sinking to the floor. Besides the size issue, this product is everything you’re looking for in a dog bed. In fact, it’s possible your dog will never want to sleep in your bed ever again with the amount of comfort this bed provides. The Dog’s Bed is a pretty self-explanatory name but doesn’t really tell you much about the quality. The features of this outdoor waterproof dog are spectacular. Has a removable, washable waterproof liner that makes sure it can take the full brunt of an oncoming downpour. This dog bed has high-quality, luxury memory foam that will provide your dog with a sleeping experience they’ll never forget. To be honest, you might end up being jealous after you feel the softness of this bed. As with other options on this list, the foam makes this an essential purchase for owners with senior dogs. Sleeping on soft surfaces does wonders for dogs with joint issues. It doesn’t just help dogs with joint issues though. This bed is an excellent purchase for any dog going through post-op or any injury related to their limbs. It embodies the idea of being comfortable. 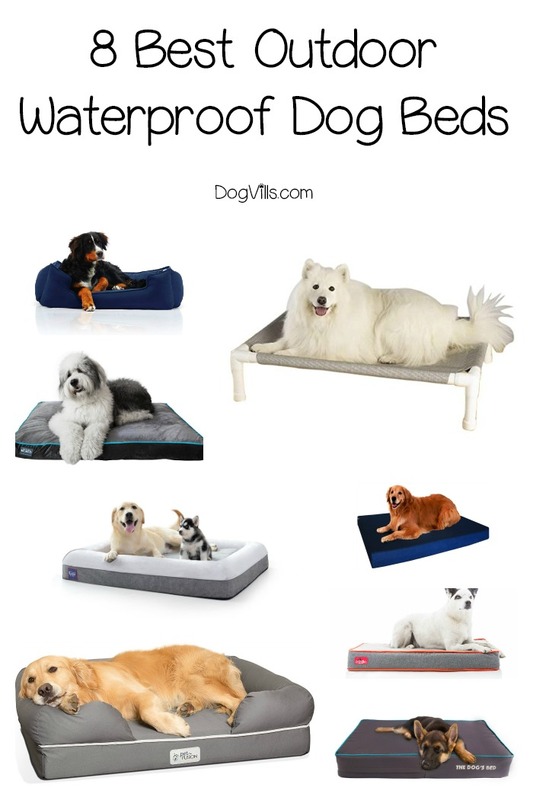 The bed’s cover being fabric resistant to molds, mildew, and mites is a nice touch: an extremely convenient feature for dog owners living in damp environments. Comes in seven different colors and five different sizes to give you all the choices you could ever want. The description mentions it’s an outside bed, but it doesn’t seem like it’s the intended purpose. It says, “Can also be used as an outside bed,” rather than is an outdoor dog bed. There are some reviews citing durability concerns that are worth considering before purchasing. Comes in five sizes: small, medium, large, XL, and XXL. Aside from certain buyers citing durability concerns, there isn’t much to complain about with this outdoor waterproof dog bed. It has incredible features and a price that doesn’t hit the checkbook too hard. Filled with memory foam. So, you know it offers a certain level of coziness. Created with premium materials. These premium materials make this dog bed one of the most durable and high-quality on the market. Overall, its features don’t differ much from the other dog beds on this list. It has a waterproof liner, memory foam, washable covers, etc. It has everything you could ever want. The addition of the second cover gives you a back up just in case something happens. It also allows you the ability to choose which cover fits your dog’s personality. After all, the ability of choice is never a bad thing to have in your life. Doesn’t have a unique feature that makes it stand out. Bad reviews concerning the waterproof linear not being entirely up to snuff against bathroom accidents. The smell can linger. This outdoor waterproof dog bed is a dependable, high-quality place for your dog to sleep for the many years left in their lives. Nothing spectacular about it, but it will do its job. The Petsbao Premium Orthopedic Dog Bed & Lounge was crafted to fit all your dog’s outdoor lounging needs. 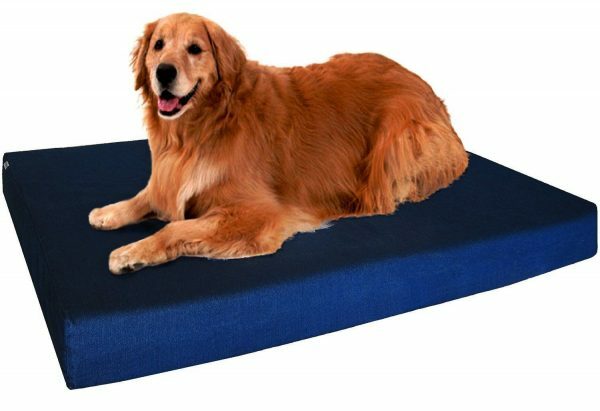 It’s filled with orthopedic memory foam to support your dog’s body comfortably. This orthopedic memory foam is made especially for dogs coming off injuries to their limbs. It’s made to soothe and create an environment of extreme comfort. Has a sleek design that comes in a variety of different colors. Making sure one of them appeals to your particular fashion sense. Comes with a waterproof liner to protect itself against those pesky rainstorms or bathroom accidents. And when those bathroom accidents do occur, it’s not a big deal because this bed is machine wash ready. You simply unzip the cover and throw it into the washing machine. It also helps the outside cover’s both stain and tear resistance to help account for any mistake. The cushion part is a little flat compared to the other beds on this list. Some issues concerning the waterproof cover, however, with liner built in this shouldn’t be a big issue. With all these features, it’s clear Petsbao made sure to cover all bases when creating this incredible dog bed. The Brindle Waterproof Designer Memory Foam Pet Bed is a worthwhile choice for any pet owner. It’s a durable, soft bed that comes with a non-slip bottom and is made from soft fabric to ensure both comfort and practicality. You don’t have to worry about either your dog or floors with this dog bed. It has a waterproof layer to protect the bed from any mess the weather or your dog could provide. The cover can zip off and quickly be machine washed in dire circumstances. Inside the bed is 2-inches of memory foam mixed with 2-inches of high-density support foam. This mixture creates perfect bedding for those daytime naps every dog enjoys. The bed itself is durable, but the cover doesn’t seem hold to the same standard. There are a couple of reviews mentioning the cover being ripped. This dog bed comes in three sizes: small, medium, and large. This outdoor waterproof bed may not have all these unique features; however, it makes up for it with its practicality and price. It’s the best bang for your buck item on this entire list. The Pipe Dreams Outdoor Elevated Pet Bed is designed to keep your dog dry and warm. It is elevated so that your pup is not on a hard, cold or wet ground. Its elevated structure provides comfort for arthritic dogs by giving them something stand on that isn’t rough. They can sit up without having to deal with the hard, unforgiving ground making their joints ache. If you’re worried the elevated structure will make it tough on a dog with joint issues, don’t. Getting up on this bed doesn’t take much effort. In fact, it won’t even require a full jump. Most likely, a lift of the paws and climb will do just fine. The frame is sturdy, made with durable PVC pipe and also features a strong nylon cover that is poly-coated and can be removed to machine wash. It takes no time at all to put this outdoor bed together since no tools are needed. Easy to take care of since cleaning just requires a hose down and a brushing. A little different cleaning technique from the other beds on this list, but still relatively simple. Some dogs find the elevated platform odd and won’t use the dog bed. The Pipe Dreams Outdoor Elevated Pet Bed is a low maintenance, relatively inexpensive option for dogs that need a little elevation in their lives. All these outdoor waterproof dog beds will keep your canine pal comfy and in style. However, the option I’d recommend is the Dogbed4less Orthopedic Memory Foam Dog Bed . It has all the features the others have and offers a wide variety of sizes to fit a dog of any size. You’ll be able to find the right size for your dog’s exact bedding needs without much difficulty. Also, the price is relatively decent compared to the others on this list. It’s not the best or the worst, it sits directly in the middle, while, having all the features necessary for an excellent outdoor waterproof dog bed! 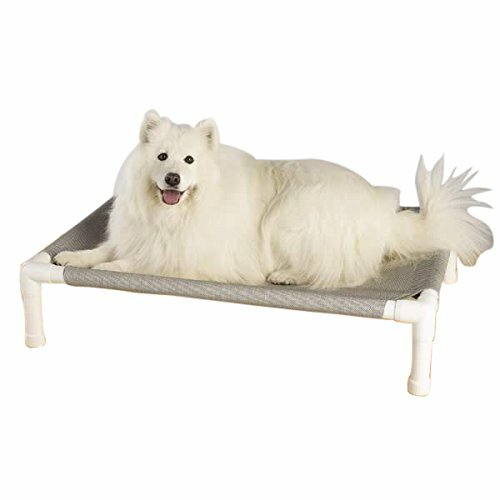 But, if your dog’s prone to bathroom accidents, my recommendation would go to the Pipe Dreams Outdoor Elevated Pet Bed . The elevated feature is great, and the price isn’t too bad either! What are your thoughts on these top outdoor waterproof dog beds? Do you have any of the ones above? Tell us your favorites!